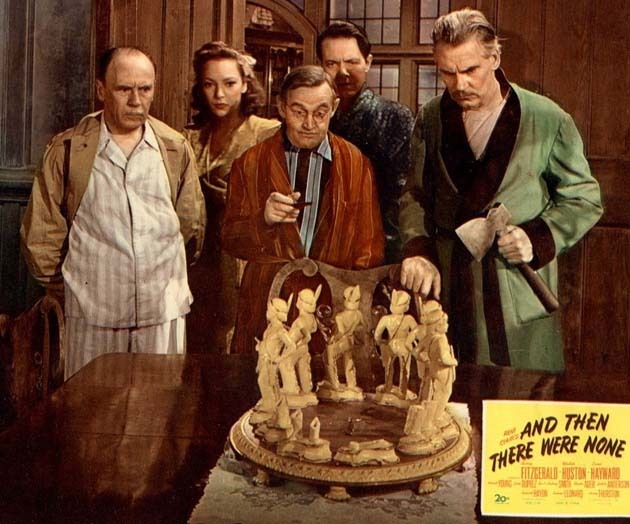 'And Then There Were None' movie with Barry Fitzgerald, Walter Huston, June Duprez, Louis Hayward and Roland Young. One of the best-known Agatha Christie novels, And Then There Were None will be getting another big-screen transfer. 20th Century Fox has acquired the movie rights to the literary suspense thriller first published in the U.K. (as Ten Little Niggers) in 1939. Morten Tyldum, this year's Best Director Academy Award nominee for The Imitation Game, is reportedly set to direct. The source for this story is Deadline.com, which adds that Tyldum himself “helped hone the pitch” for the acquisition while Eric Heisserer (A Nightmare on Elm Street 2010, The Thing 2011) will handle the screenplay adaptation. And Then There Were None is supposed to have sold more than 100 million copies worldwide, thus holding the record as the best-selling mystery novel in history. In Agatha Christie's novel, 10 strangers find themselves as guests of a mysterious – and unseen – host who had lured them under false pretenses to a little, isolated island off England's Devon coast. One by one, each guest meets sudden death. After a(n absurdly long) while, the survivors realize that one of them is responsible for the murder rampage. But why? Well, in the past each one of them had committed a murder, but had succeeded – until then – in evading punishment. The best-known and best-regarded film version of And Then There Were None is René Clair's 1945 release, adapted by Dudley Nichols (Oscar winner for The Informer) and distributed by 20th Century Fox itself – which, curiously, allowed the movie's copyright to lapse. The ending, as to be expected from a Hollywood production, isn't nearly as grim as the one found in the novel. In the cast: Barry Fitzgerald, Walter Huston, June Duprez, Louis Hayward, Judith Anderson, Roland Young, and C. Aubrey Smith. In 1965, Ten Little Indians – a variation, for obvious reasons, of the novel's original British title – starred Hugh O'Brian, Shirley Eaton, Fabian, Leo Genn, Stanley Holloway, Wilfrid Hyde-White, Daliah Lavi, Dennis Price, Marianne Hoppe, and Mario Adorf, in addition to Christopher Lee in an uncredited role. A largely forgotten 1974 remake was directed by Peter Collinson. In the stellar international cast: Stéphane Audran, Charles Aznavour, Elke Sommer, Gert Fröbe, Alberto de Mendoza, Adolfo Celi, Herbert Lom, Richard Attenborough, Oliver Reed, Maria Rohm, and the voice of Orson Welles. 'Ten Little Indians' 1974 movie trailer. Stanislav Govorukhin's 1987 Russian version, Ten Little Indians / Desyat Negrityat (the original Russian title is a translation of the novel's original British title), reportedly kept Agatha Christie's downbeat ending. For all they're worth, user reviews on the IMDb have been generally enthusiastic. In the cast: Vladimir Zeldin, Tatyana Drubich, Aleksandr Kaydanovskiy, and Aleksey Zharkov. Catherine Bailey. Douglas Booth. Charles Dance. Maeve Dermody. Burn Gorman. Christopher Hatherall. Anna Maxwell Martin. Sam Neill. Miranda Richardson. Toby Stephens. Noah Taylor. Aidan Turner. Eileen Brennan. James Coco. Peter Falk. Elsa Lanchester. David Niven. Peter Sellers. Maggie Smith. Estelle Winwood. James Cromwell. In addition to a blind Alec Guinness and a mute Nancy Walker as The Help. Passengers (2016), currently in pre-production. Jon Spaights wrote the screenplay for this sci-fier to feature Jennifer Lawrence, Chris Pratt, Michael Sheen, and Laurence Fishburne. Best Foreign Language Film Bafta-nominated thriller Headhunters (2011), with Aksel Hennie, Synnøve Macody Lund, Nikolaj Coster-Waldau, and Eivind Sander. The thriller Fallen Angels (2008), with Trond Espen Seim. Buddy (2003), a comedy-drama toplining Nicolai Cleve Broch. Image of Barry Fitzgerald, Walter Huston, June Duprez, Roland Young and Louis Hayward in And Then There Were None: 20th Century Fox, via source. Ten Little Indians 1974 movie trailer: Avco Embassy.